The Situation in Belfast takes a dramatic turn, as the Lord Mayor actively appeals for strikebreakers to come forward. A sensational development in the strike situation in Belfast was reached this morning, when military troops were installed in the Belfast electric power station and gas works as "a precautionary measure". In the proclamation, which has been issued, the Lord Mayor states that his repeated applications to the Irish Executive for adequate protection for workers, volunteers, or others, to maintain municipal services have at last been granted, and that, relying on the assurances of the commander-in-chief in Ireland, and on the statement of the Prime Minister at the opening of parliament, he invites all members of the community willing to offer their services as workers to send in their names to him. It is understood that the tramway, electricity, and gas services will be resumed today. The result of the strikers' ballot shows that about 15,000 did not record their votes. Belfast gas and electricity supplies, which have been suspended for three weeks, were restored this morning. Up to 11 o'clock no attempt had been made by the Corporation to commence the tramway section, which has.also been in abeyance since the present shipyard strike started. The troops will remain in occupation of the gas works and electricity station for the protection of the works so long as their presence is deemed necessary. The strikers ceased work on Saturday, January 25th. The strike is thus three weeks in progress to-day. The outlook is considered very grave. The Lord Mayor of Belfast, Mr. John Campbell White, this morning has issued a proclamation to the citizens setting forth that widespread hardships are being put on all classes of the community due to the suspension of the Corporation's electricity and tramway services; that the hardship is pressing particularly on the poorer classes; that the medical profession have, in many instances, heen unable to render suitable medical aid to alleviate the suffering of the sick and helpless; and that the great majority of the citizens are in no way involved in or connected with the dispute giving rise to the strike. I have been unable to obtain any assurance that military forces would be available for the due protection of the workers, whether ordinary employees or volunteers, in the departments affected,, except in the event of actual serious disorder or a breach of the peace. I would not have been justified in jeopardising the lives and property of the citizens who might have volunteered their services to operate the said municipal undertakings without being able to promise them adequate protection, which protection, notwithstanding my repeated and persistent applications for same to the Irish Executive, has only now been guaranteed by the Commander-in-Chief of the Military Forces in Ireland, and will be forthcoming. The Lord Mayor goes on to say that, relying on the assurance that he has received from the Commander-in-Chief of the Forces in Ireland, and on the statement of the Prime Minister, in his speech at the opening of Parliament, that no section of the community would be allowed to hold up the whole nation, he invites all members of the community who are prepared to assist in putting an end to the prevailing and lawless and wholly unjustifiable attack on the common rights of the citizens by offering their services as workers, to send their names, addressed, and occupations him at the City Hall, so that effective measures may be taken whereby the complete restoration and continuous working of tho municipal services may be assured. "Who says our country's soul has fled? Who says our country's heart is dead? Come let them hear the marching tread of twice five thousand hurling men. They hold the hopes of bygone years. They love the past - its smiles and tears; But quavering doubts and shrinking fears Are far from Ireland's hurling men." So wrote Brian O'Higgins, and we could heartily wish that his inspiring lines could reach all the hale and hearty young Irishmen of today. He found a clarion call to the young men of our nation, would hear the call were taken up and an unselfish effort made to promote and develop the grand idea nurtured and given us by one who is now one of the accredited leaders of Gaelic opinion. At the moment he lies in a cold cell in an English gaol and it would gladden his heart to know, that the plain little message which he penned in a moment of security and tranquility- when he was a "crank" - was being taken up and translated into action; to know that the young Gaels of Erin, whom he recognises as the backbone of the national fabric, were issuing forth to the playing pitches in their thousands under the GAA banners playing their physical proficiency to their own end the national advantage, and delighting their enthusiastic followers. We could heartily wish this were actually the case, but if we stop a moment to consider the position of the G.A.A. in Carlow and the surrounding counties where this paper circulates what do we find? Certainly not the ideal of Brian O’Higgins translated into activity of even reasonable standard. And If we enquire what are the young Gaels who feign to be so proud of their nationality and characteristics doing, we find the total of their activities summed up on the word NOTHING. Now this state of affairs cannot, and should not, be allowed to continue. The distinctiveness of our nationality owes as much to our physical abilities, our love for manly games and pastimes, as our language, literature and art. To neglect, discourage or deliberately wipe out this characteristic ils unpatriotic. If we shun it as undignified or an anti-respectable thing to cherish, play or promote Gaelic games we openly profess that we are degenerate; and the slave status is the only status that should claim Erin's young men today, if they fail in their duty to their national pastimes. Since the birth of tho G.A.A. in 1884 it has had a chequered, but glorious record. Its uncompromising national attitude accounts largely for its success. In its early days Parnell, O'Brien, Bishop Croke, O'Leary and Davitt were its patrons. These men were at that period leaders of National thought. Today we have amongst the elected representatives of the people young, strong men who have been prominently identified with national athletics. We have Harry Boland, the famous Dublin hurler, a fearless and chivalrous Gael; we have Austin Stack, the captain of the first Kingdom team to win an All Ireland Final; Sean Etchingham, is Chairman of the Co. Committee of the model county; and J. J. Walsh, whose chairmanship of the Cork Co. Board made it one of the foremost in the country. We believe that the path marked out by these and many others is the one for lesser lights among the Young Irelanders of to-day. The organisation and reorganisation of the G.A.A. must be proceeded with, our athletic fitness must be conserved and trained. England boasts that her battles were won on the playing fields of Oxford and Eton, but Ireland's battles were won and will be won on the playing fields of Ireland. A serious attempt Is being made to re-establish tho G.A.A. on sound business lines in Carlow. For years we have been the most backward county in the mismanagement of affairs and the consequent apathy of many people who would otherwise have been a source of strength . In conjunction with many other things, these important disabilities had nearly extinguished the organisation,and indeed the same applies to the adjoining portions of Queen's Co., Kilkenny and Wicklow. As regards Carlow, we are glad to know that the Leinster Council is assisting in the much-needed work of reorganisation, and a representative', active and useful committee will soon take charge. To members of the Gaelic League a special word of appeal is directed in connection with the proper re-establishment of the Association. Dr. Douglas Hyde once stated that the G A A paved the way for the language movement. The Gaelic League is a well-organised body in Co. Carlow and the duty of the Branches and individual Gaelic Leaguers is plain. The Association which paved the way for your League now needs your assistance, and not in vain do we seek hope. To Nationalists who profess the doctrine of "Ireland Overall" appeal Is also made, and to sportsmen who enjoy manly combats we also look for support. The clubs which exist in Graiguecullen, Bennekerry, Tulow, Grange, Rathvilly, Ballon, Clonmore, Kildavin, Clonegal, Myshall, Drumphea, Bagnelstown, Tinryland and Nurney require reorganisation, while there is plenty of room for new clubs, particularly at Carlow, Borris, and several other South County Districts. Mr. Seamus Hickey, Bennekerry Cottage, Carlow, has been appointed provisional Co. Secretary until forthcoming Convention. After a fortnight's duration, the Maryborough gas strike has been settled, the employees returning to work on being offered an increase of 6s per week, being an advance of 2s on the Gas Co.’s former ofer, which was rejected. The men's wages are now 42s a week. The strike at Messrs. P Kelly and Co's foundry has also been settled, the employees, who have been on strike for a considerable time, having been given an increase of 7s, and in more in some cases. The decision of the Maryborough Sinn Fein Club to open a lending library in Maryborough is one which we are sure will moot with general approval. The want of a lending library of the right sort has long ,been felt in our towns, and is one of the principal disadvantages upon which the inhabitants suffer. Unfortunately the cheap, thrashy, alien Press has placed literature in the hands of the Irish people which should never be found there. For a long time it seemed almost impossible to place on the market fairly reasonable priced books which would appeal to the reading public, and until quite recent years there was not any considerable demand for publications racy of the soil. Now, however, there is a plentiful selection of such books being turned out in the Metropolis, and the new lending library will be stocked with those. We understand that premises for the library have been provided by Mr M. Gray at Main Street, Maryborough, and that Miss Gray has consented to give her services as librarian. 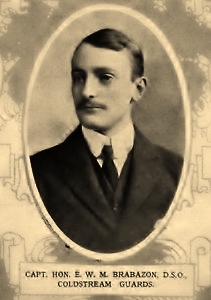 Ernest Brabazon, the youngest son of Reginald Brabazon, the 12th Earl of Meath, who lived in Kilruddery House. He died in June 1915 in France from shrapnel wounds. He was 31 years old, and had married shortly before the outbreak of the war. He was the best know resident of Bray to die in the war. The Memory of the Brave. The proposal to honour the brave men from Bray who fell fighting the Germans will, it is almost certain, be heartily endorsed by the residents. When it is remembered how well they have supported every fund and organisation which helped towards the victorious termination of the war,, the memorial to perpetuate the memory of the noble dead shall claim their entire sympathy. Bray’s toll has been, a heavy one. It is estimated that at least 150 have given their lives in the Allied cause. They embrace representatives of every class in the township, from the son of the Lord of the Manor, the Earl of Meath, down to the son of the humblest in Little Bray. They went with a free will, and it is fitting that their memory should live in the enduring memento to their gallantry which is now to be erected.